Blackjack is the new playable character in Call of Duty: Black Ops 3. The ominous specialist is none other than the grim seller of the black market. You can now play the role of a merchant in the multiplayer mode. However, in order to do this, you must activate a mercenary job and complete weekly assignments. In the black market you can get new contracts daily and weekly. 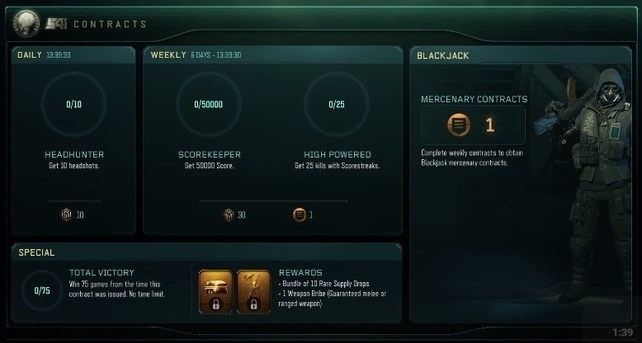 However, to get a mercenary job in the black market you must have completed the two weekly contracts. 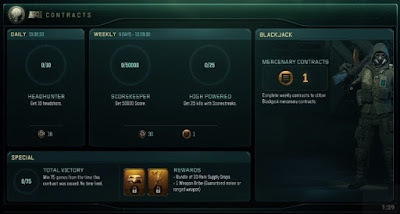 These tasks include for example, you must achieve a series of shooting: for 20 wins you get 30 crypto keys and 50,000 points weekly for the release of the mercenary contracts for blackjack. Once you have completed go to the menu to select your specialist. Blackjack comes first, after you have unlocked him with the corresponding mercenary contract. In this case, you now have a full 60 minutes gameplay with blackjack. The skills or abilities of blackjack are Rogue and Gambler. With players you can acquire a random ability of an opponent. Rogue lets you copy the specialists weapon an enemy. We give a brief overview of how the skills work, so you can well prepared in the next duel. Gambler: This ability fills up very quickly and gain access to a capability of other specialists. But you should pay attention to the circle at the bottom right of the screen until it has filled up. Each firing of other players through you get a bonus, whereby the bar fills up quickly. When you are ready, you can use O button / B button, or using the directional key to "pull" a new ability to the left. The previous one is naturally cleared by the new random ability. Rogue: If you can manage to achieve five wins, then this ability of blackjack is activated. With this skill you get the specialist weapon of the player you killed last. If you get another kill, then another weapon at the bottom of the screen. Now you have the choice whether you want to switch to the new weapon with the O button / B button. However, this decision may then not be undone and you cannot redial a dropped weapon. By Perk overclocking you need a kill less to trip the rogue ability of blackjack.